Lovely prints from UK Based New House Textiles. I especially adore the Sweetheart Collection. There are so many wonderful blogs that feature an array of amazing textiles, so I thought it would be fun to share some of the links that I stumble upon here on Crafty Hues. First up is the fabulous Fly Girls blog of the super creative Andrea Pippins. She has a wonderful collection of textile inspiration on her blog. Click Here for Textiles! Aren't these pieces gorgeous!? The beauty, passion, creativity, and techniques never cease to amaze me when it comes to traditional textile design. These pieces are called Suzanis and are hand crafted by the women of Central Asia. Usually the embroidery stitch used in these pieces are that of the chain stitch, so in the spirit of these beautiful embroidery stitches, I thought I would post a mini tutorial video i found on how to embroider a chain stitch! Making a Suzani: Each suzani is unique in design. 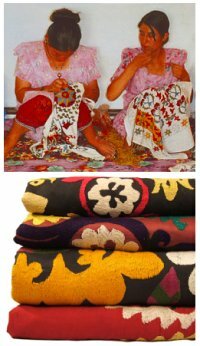 To be a suzani designer was, and continues to be, the prerogative of specialists. Traditionally, the skill passed from mother to daughter and certain families became renowned within their communities for their patterns and symbols. Though the end product is distinctive, most suzani designs derive from the same compositional scheme; a central field surrounded by borders on all four sides. This scheme has a long tradition in the arts of central Asia, and in Islamic art in general. Traditionally, suzanis were made entirely by hand and could take around 18 months to complete. Cotton was the most common ground cloth, woven into long strips about 12” wide. Anywhere from three to six strips were tacked together to create a large piece of cloth. Using black ink, a designer would draw, often freehand, a pattern on the cloth. Once the color scheme was agreed upon, the stripes were separated so that different women could work on the embroidery simultaneously. When the embroidery was complete, the strips were sewn together again. Sometimes the embroidered motifs and colors did not align precisely when the strips were rejoined. Such inconsistencies were not flaws, but simply by-products of the process. Gorgeous pillow color waves and designs from Textile Designer Jennifer Neill of Judy Black. here is a little bit of info about Jennifer that I grabbed from her website. You may find that I will begin posting the bios of designers and crafters here more as I am always inspired by their summarized journey towards a creative careers! About Jennifer: "Jennifer Neill is solely involved and responsible for all aspects of the design process, from the original print idea to the final garment. Jen loves the purity and romantic nature of the handcrafted process and feels tied to the tradition of textile design. Her work spans from tight five-colour, registered by eye, t-shirt graphics to loose free-style intuitive printing. The following is a general overview of the creative progression of each piece. Donna Gorman!s fresh, colorful and innovative work graces the products made and sold by some of the best names in contemporary design...... like Crate& Barrel and Marimekko, where she was vice president of licensing and design until 1992, when she started her own design firm retaining Marimekko as a client. Trained as a photojournalist, Donna Gorman has kept the photojournalist!s instinct for connecting with details of everyday life. Her designs are often born in the images she she captures with her camera during her travels to singular, eye-catching locales like Morocco, India, or rural Mexico. The photographs serve as inspiration- visual field notes- to be transformed with brush and vivid colors into paintings that are ultimately reproduced in her designs. collections, and her work and home have been featured in publications like I.D. Magazine, Abitare and Metropolitan Home. Gorman!s design work is part of the permanent collection of the Museum of Applied Arts in Munich, Germany. A frequent guest on several shows on HGTV, tapes of her appearances are being sent to key retailers across the country to promote her products. William Morrow published her first book, “The Artful Table”. A second is in the works,combining two of her life!s passions, travel and entertaining. So, I finally finished the "Berry Ava" Baby Blanket! Yay! Even though there are obvious flaws when it came to the printing with the embroidery hoop and modge podge, I must say that I love the outcome! I kept it simple and sewed on a pre-quilted chocolate brown baking to the fabric. It looks great and I hope baby finds comfort within it! I could not resist adding in the "handmade with love" tag, which will do for now until I feel worthy of a professional Crafty Hues tag..LOL. Ok, things will still be sporadic as I am due this Sunday and may have to be induced sometime next week if she does not arrive on her own. So, last night I decided to muster up the courage to go ahead and print one of the fabrics that I will use in the baby blanket for our little girl who is due next month. I really have been putting it off, as I did not want to TOTALLY screw it up as I did not have money in the budget to buy more fabric. Nevertheless, I VERY much consider this a practice run as I am still using the hoop screens and modge podge(which explains the random smudges and pinholes...LOL). I think with my next print I will go ahead and use a true screen, but for this project, I will continue with this print. I do have one question...How do I prevent my screen from picking up ink if it is laying on top of the print next to it..should I print every other row and let dry and then print in between or do I just wipe after each print..any suggestions? As I was reading the lovely and might I say very resourceful blog Celestina Carmen, which is a blog about screenprinting, sewing, & crafting; I learned that I should really raise my screen just a bit from direct contact to the fabric to help prevent smudging so I will definitely be experimenting with that soon. Also, I failed to use a fixative in my ink, so I have to be sure to order some to help my color set better. Nevertheless I am pleased with the design and can really see this motif in lots of different things. I call it Berry Ava because our little girls middle name will be Ava! So, I just wanted to quickly share my progress. I must say that screenprinting while pregnant can be a bit of a challenge! : I will be back some time next week and will post pics of the completed blanket. It really won't be to complicated...quite simple really. Ok, thanks for listening and I will be back soon! Happy creating! I thought it would be fun to every now and then share some textile inspiration by picking a print to highlight from time to time. To start things off I have selected this print from the Manderley collection by Romo Fabrics. I love the colors, and the pattern is great! I will be highlighting both manufactured and hand printed fabrics, so if you come across a great print that you think should be highlighted, then feel free to shoot me an e-mail! Don't you just love getting art & craft supplies in the mail! I finally received a few goodies in the mail today! I recently ordered some basic screen printing/fabric ink, some speed clean, and a wonderful color theory book called the "Color Mixing Bible". I LOVE this book as it has so many examples of the various techniques and ways that one can mix colors depending on consistency and shade! I bought this book first to add to my collection, because in my opinion, knowing how different colors work together as either the top or bottom layer is extremely important when hand printing. Many times I would find myself confused on which order I would apply my ink/paint and then i would end up with a disaster and a waste of product. So I really think that this book will be a good aid for when i need a bit of color mixing inspiration. It includes color mixing for: watercolor, acrylics, oil, gouache, colored pencils, ink, and pastels. I bought mine "like new" for only $8 bucks via amazon & it is in perfect condition (I heart amazon)! I decided to go with Versatex for my ink as I remember it worked quite well in my past printing sessions, so we will see if I still feel the same way after a few practice rounds. If so, I will order a few more colors! I plan on making my mom a yard of fabric for her birthday and to print my own fabric to make a baby quilt for our little girl that is due in May...the colors for that will be pink & brown. Wish me luck! If they come out properly I will most definitely post them here. Thank you so much for stopping by my little abode where I daydream about lovely things to create for lovely people! Textile Artist & Designer Ericka Taylor loves all things textile, colorful, unique, and handmade. Here you will find the inspirations behind her work! Feel free to browse a bit & don't be a stranger! 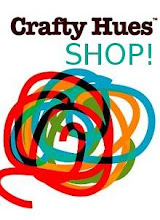 SHOP The Crafty Hues Collections!